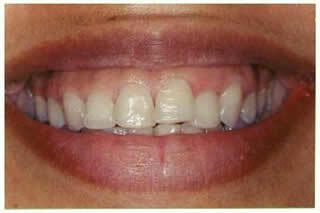 Patient has a gummy smile that shows lot of her gum when smiling. Also the upper front teeth are crooked and short. The cosmetic gum surgery reshapes her gum to establish an even contour and moved her teeth higher so that her gum does not show when smiling. 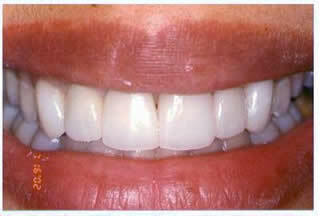 The new Empress veneers correct the color of her teeth and make her teeth longer so she appears younger.